If you’ve followed our website at all you know that I usually steer clear of the RPG genre. It’s a genre that I admire, but from a safe and protected distance. However something caught my eye in recent weeks that I couldn’t let slip through the cracks. The game is Child of Light and it’s one of the most gorgeous and heartwarming gaming experiences I’ve encountered in quite some time. Child of Light is developed by Ubisoft Montreal. Yes you read that correctly, Ubisoft Montreal. Probably not the most likely candidate to be developing a game such as Child of Light but that’s neither here nor there. The game follows Princess Aurora who, within moments of the opening cut scene, dies and goes to the land known as Lemuria. Lemuria is a dark and evil place, and you as Aurora must bring light back to the world. Immediately you are joined on your adventure by Igniculus, a small blue orb that assists you along the way. You control Igniculus either with a second player or with the other analog stick. What struck me about Child of Light right from the opening moments was its beauty. Not only does Child of Light tell an exquisite tale, but its visuals are some of the most heartwarming in games. There is a beautiful whimsy to the experience that makes playing this 15 hour adventure a delight. 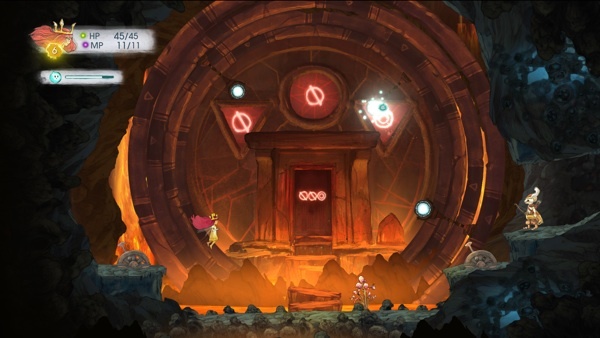 The game opens up as a slight platformer, but soon after Aurora learns to fly and that gives way to minor puzzles. For the most part, though, Ubisoft Montreal wanted you to be able to sit back and enjoy the splendor of the story book visuals and quirky storyline. Much if not almost all of the games dialogue is said in rhymes. The writing in the game is at times brilliant and at others a bit forced. It’s a nice tact but at times the rhymes aren’t all that sublime. See what I did there? I mentioned at the top that I usually steer clear of the RPG’s but this one drew me. Child of Light does have a robust turn-based combat system that at its core is pretty simple but, like many turn-based RPGs, there is a sneaky amount of depth to it. Below each battle is a fighting meter that has a cool down period and a casting bar. All characters on screen will move along this bar and will select their move once their character reaches the cast portion of the bar. From there depending on what you select your character will finish the bar and do said action. It’s an interesting mechanic which makes the player focus heavily on timing. If you’re able to get a quick hit in before your opponent who is also in the casting section of the bar you can disrupt their attack and push them back to the start. During battles you can also switch out your party members and use Igniculus. In fact, Igniculus can be an incredible asset in the game. By hovering the little blue orb over an opponent it will slow the enemy down. Or if you hover over one of your party members it will heal them. There is a meter that will drain and you can also move the orb around the screen to pick up health buffs up as well. It's an ingenious system and one that I think both long-time RPG fans and newbies like myself will really eat up. The only real problem I had with Child of Light was the difficulty. There are currently only two difficulties for the game: hard and normal. I tried hard and I don’t have the mind for RPGs to be able to handle it. On the other hand the normal difficulty is far too easy. The ease does work in letting the player enjoy the experience, it still would have been nice for a bit more challenge towards the end. I got to the point where I was breezing through battles without mixing up my attacks or using much strategy. But the lingering feeling like you’ve done all of this before never left me throughout my time with the game. And for a game that’s supposed to take place over 10,000 years ago that’s a problem. 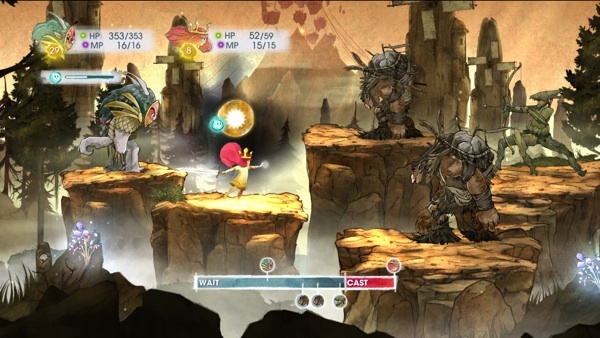 Child of Light is the type of game that the industry needs right now. Digital distribution is gaining popularity, and some of the oldest and largest publishers are struggling to adapt with the newer market trends. Some are stuck attempting to hit it big every few years with another large AAA title, or have ventured into the realm of free-to-play mobile titles. Ubisoft is well aware of where the market stands, and is mixing it up with AAA titles and smaller, more unique experiments. Child of Light is worth checking out, even if you don’t normally follow the role-playing genre. And although there are a few downsides, it is still one of the biggest surprises of 2014 so far.